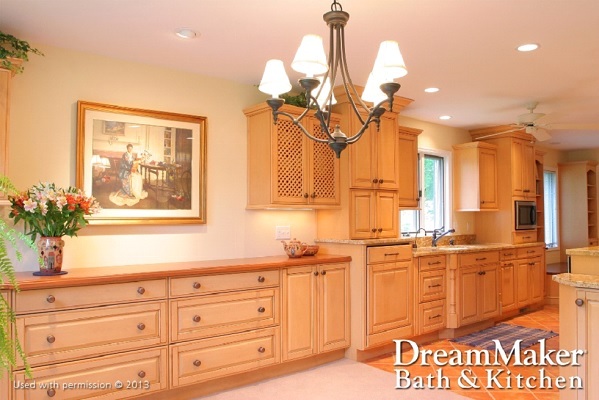 At DreamMaker Bath & Kitchen of Elizabethtown, our home remodeling contractors find that for many area homeowners, the kitchen cabinets are the most critical element of the room. If you truly want to transform your kitchen, replacing your old, worn-out kitchen cabinets with beautiful custom cabinetry is an excellent place to start. Here are three big benefits of custom cabinetry for your kitchen. If you are planning to sell your home – even if a few years down the road – you need to take a hard look at your kitchen cabinets. Today’s buyers long for custom cabinetry, so give your home remodeling contractor a call before you contact a real estate agent or settle on an asking price. If you have ever struggled to put away pots and pans or searched in vain for that spice you need, you will appreciate this benefit of custom cabinetry. When you install custom cabinets in your kitchen, you can design your own storage solutions from the ground up, so you will no longer have to worry about organization. The kitchen is the focal point of your home, the place where your meals are planned and prepared. The quality of kitchen cabinets can have a significant impact on the ease of your meal preparation, so you can spend less time cooking and more time enjoying the fruits of your labor. From increasing your storage space to making mealtime easier, there are many benefits to choosing custom cabinets for your kitchen and your home. If you are ready to put your old, tired kitchen to rest, DreamMaker Bath & Kitchen of Elizabethtown can help you do something about it! Our designers have remodeling options to suit any style, from transitional kitchen design ideas to ideas for the contemporary chef. When you are ready to get started, just call (717) 340-9330 or submit our online form to start a conversation.